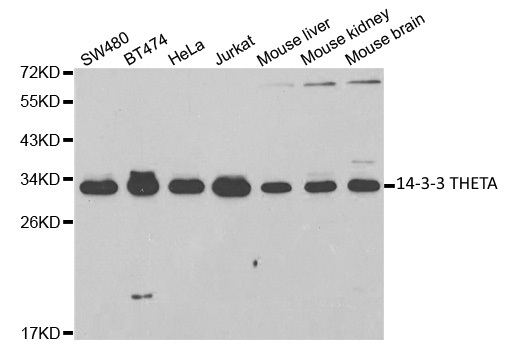 Western blot analysis of cell and tissue lysates using Rabbit anti 14-3-3 theta antibody (AHP2425). 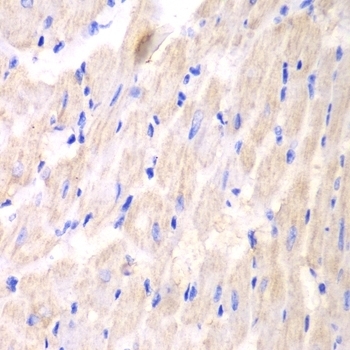 Rabbit anti 14-3-3 theta antibody recognizes 14-3-3 theta, also known as 14-3-3 protein T-cell, 14-3-3 protein Tau, Protein HS1 or YWHAQ. 14-3-3 theta is a member of the 14-3-3 family of proteins. 14-3-3 proteins regulate multiple cell signaling pathways through their interaction with discrete protein sequences. Antiserum to 14-3-3 theta was raised by repeated immunization of rabbits with highly purified antigen. Purified IgG was prepared from whole serum by affinity chromatography.